Venus is the brightest planet and is sometimes visible with the naked eye. The size of the planet is similar to Earth’s, so Venus is sometimes called “Earth’s twin,” but there are few other similarities. A thick layer of clouds around Venus causes it to appear bright white from Earth. This is the result of sunlight reflecting off of the cloud layer, which is in fact made of sulphuric acid, a very unpleasant substance. The cloud layer creates a greenhouse effect that keeps the planet extremely hot. 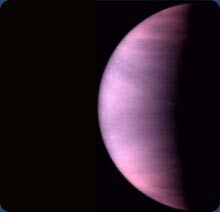 The air pressure on Venus is strong enough to crush submarines, and the winds are usually faster than a tornado. For these reasons, Venus is difficult to study—the few spacecraft that have managed to land on Venus have all been destroyed in less than an hour. Most of what we know about the surface of Venus comes from spacecraft that have studied the planet from a safe distance away.